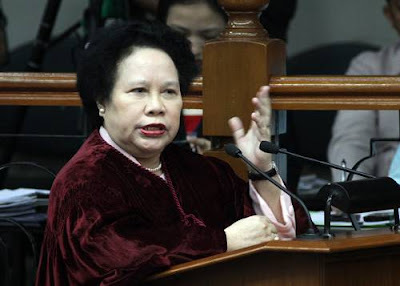 Senator Miriam Defensor Santiago said to Cory Spiritual Advisor that "there is no hell." Fr. Catalino Arevalo told to Sen. Miriam that she was deserved to the "fires of hell" over her actions in the impeachment trial of Chief Justice Renato Corona. Sen. Miriam said, “Under Vatican 2, there is no hell; but even if there is, there is nobody there." She added that in theology, "hell is not a geographical place but is "a metaphor for distance from God." Senator Miriam further explain that, "it is like St. Paul writing letters to the Corinthians, and begging them to publicize his letters. This priest sounds very much like a publicity hound. And I thought humility in spiritual matters is a virtue." However, the Senator also take note that the Constitution already separated the Church and the State. Meanwhile, Miriam Santiago has a masters in Theology from the Maryhill School of Theology. Comments or suggestions about ""There is no hell" says Senator Miriam" is important to us, you may share it by using the comment box below.